I wanted to make this a large wheel so you didn't have to leave the page to read this. I'm going to number this lesson in a list to make sure you're on the right track. 1. The center of this chart (the big open circle) is the Earth. Earth is the planet where you took your first breath. 2. The sectors or "pie slices" around you are where the constellations are. The constellations rotate around you at the rate of 1 constellation every two hours. 3. Those symbols or "Glyphs" as they are called are symbols of all the 12 signs of the zodiac. Maybe you can recognize yours! The one at the 9 o'clock position is Virgo. Virgo is like an M with it's legs crossed and Scorpio two signs away looks like an M with a tail up and ready! Now just get oriented to the set up. 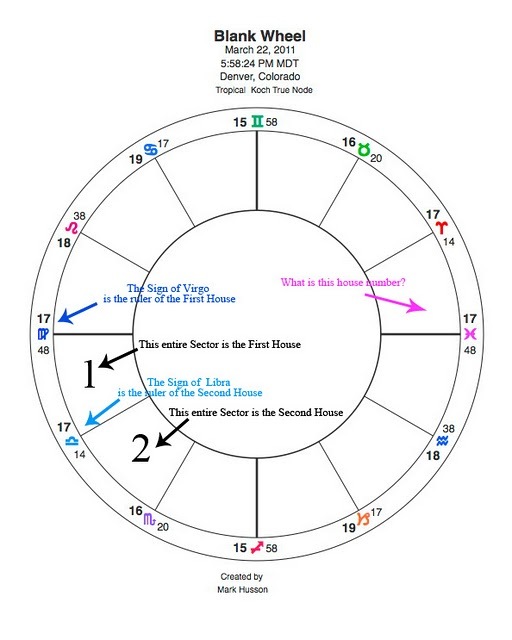 Virgo indeed is the constellation rising in this chart, making Libra the "Ruler" of house number 2. 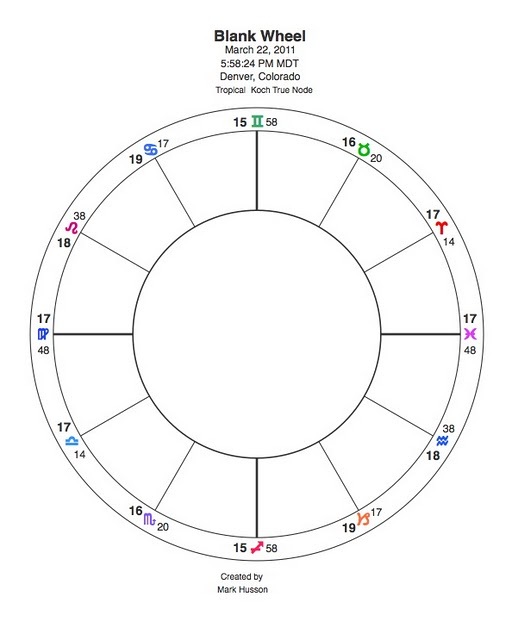 The ruler simply means that Sign gets to set the tone of the "Room" so Libra rooms are going to be all pretty and balanced while hiding all the deep intensity! Virgo rooms are usually organized and "on task". All you have to do now is see if you can identify the number of our pink Arrow and if you want to take is a step further and name the ruler, that's amazing. I'll post follow ups to these but learning these next few things will really help you follow my show. I'll quiz you later. Tip: Print the blank chart above and try to fill in all the house numbers and identify the rulers.